718-424-0844 | Make Restaurant Reservations | Order Now! 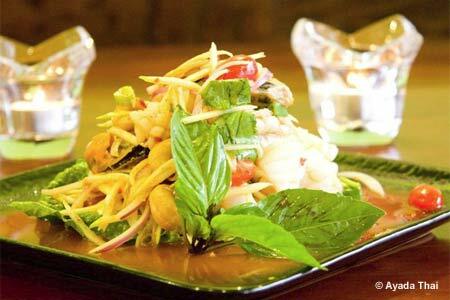 Ayada further solidifies the fact that one has to travel to Queens to get the best Thai food in the city. : Many Thai restaurants in New York tame the flavors of their dishes, particularly on the spiciness front, to comply with the Western palate. Refreshingly, this Elmhurst establishment refuses to do so. 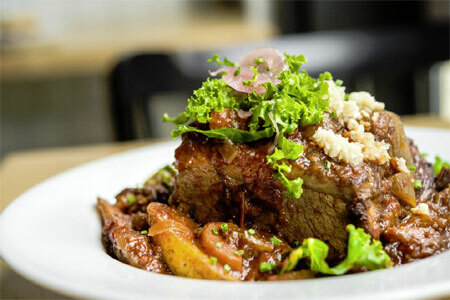 Instead, Ayuda offers bold tastes on a menu that skips around Thailand, with many of the best items landing in the south. Few Thai places in the Big Apple serve sator beans, which have a bitterness that seems to travel over one’s palate after biting into them. They’re intermingled with spicy chilies and shrimp and worth a try just for their uniqueness. Another dish one doesn’t often see outside of Thailand is the kang som sour curry (and the name doesn’t lie). Squares of omelet, infused with the herb cha-om, bob in a pucker-inducing sour coconut curry. For those who don’t want to stray from the usual canon of Thai delights, Ayada also does pad thai and drunken noodles very well. Sweep away the spiciness with a fried banana and ice cream, or just order another glass of sangría.